Can Animal Trainers and Behaviorists Be Divorced from Animal Advocacy? We recently read a blog by the good folks at Your Pit Bull and You called: Can Animal Advocacy be Divorced from Animal Behavior? In this thoughtful post, the authors contemplate if animal welfare advocates would be more effective in the long run if they were as educated in animal learning and behavior as they are in the issues related to improving animal welfare. We agree. It’s only a good thing when advocates have a deeper understanding of dog behavior and how our actions on the other end of the leash impact the dogs. Dog behavior doesn’t happen in a vacuum after all! Dogs live with us. Dog behavior cannot be understood apart from humans or the situations in which humans have placed dogs. As we advocate for fair, effective non-discriminatory dog laws and better animal sheltering practices, it’s important that we have a foundation of understanding about how dogs learn and how their behaviors are related to and influenced by our actions. In this way, we can better support pet owning families, create dog owner laws that work, and prevent more dogs from entering our shelter system in the long term. The blog got us thinking that an equally fair question to ask would be: Can Animal Trainers and Behaviorists be Divorced from Animal Advocacy? And to that the answer is also: No. Just as advocates have a lot to learn about dog training and behavior, dog trainers have a responsibility to learn from advocates as well. 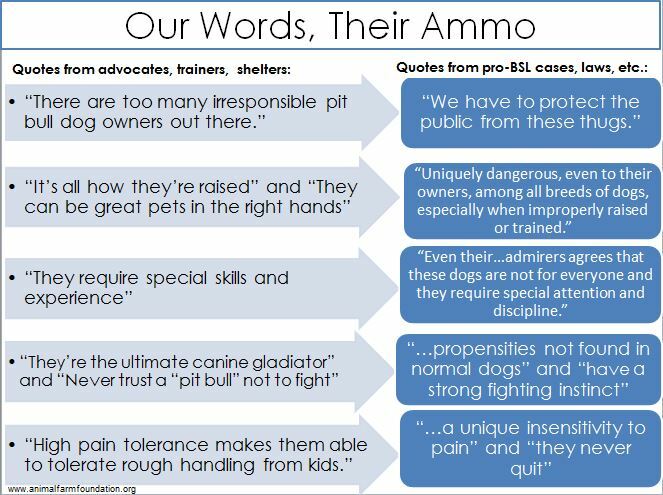 The language and the information that dog trainers and behaviorists use is perceived as fact by lawmakers, shelter workers, and dog owners. This means there is a responsibility to think carefully about how our words might be perceived and the potential our words have to influence wider audiences. Unfortunately, we sometimes hear dog trainers (as well as advocates and veterinarians) relaying information to the public that can be quite damaging for the dogs. 1. It’s a generalization about a large group of diverse dogs. Like any dog, from Labrador Retrievers to mixed breed dogs, some “pit bull” dogs may be good with younger, rowdy children, while others are not. Using generalizations about a large group of dogs distracts potential adopters from focusing on getting to know dogs as individuals. For example, a better method for selecting a kid-friendly dog is for families to choose an individual dog that is good with their children. 2. It’s easy to misinterpret. This kind of statement fails to set dogs and kids up for safe and successful interactions because, to the average listener, it suggests that it’s acceptable for parents to allow children to play roughly with dogs to the point of inflicting pain. We can help all dogs by sharing information that clearly communicates to families how they can set dogs up to succeed in our world. 3. It perpetuates myths. This statement perpetuates a myth about the biology of “pit bull” dogs which has been used against the dogs in court by those who wish to characterize “pit bull” dogs as deviant and dangerous. Misinformation like this is used to support discriminatory laws and policies which ban the dogs based on breed, not on individual behavior. Can you see how words spoken about dog behavior and training can also cause confusion for some audiences? And worse, how it can be used as ammo for fueling discrimination against dogs? With good intentions, dog trainers often say sweeping things about large groupings of dogs (not just “pit bull” dogs) and this information is then used by decision makers to justify hysteria-based discriminatory laws and policies. That’s why it’s important to consider how we speak about the dogs. Our words really do matter. Dog trainers are considered experts and their words are perceived as fact. Saying things like “it’s all how they’re raised” and “that breed isn’t appropriate for first time dog owners” about an entire group of dogs can cause real long-term problems. It’s not always easy to carefully consider our language choices, but we owe it to the dogs to think about how we communicate and how the information we share might be misunderstood or used to justify dangerous and discriminatory policies. The dogs and their families will benefit when all of us take the time to educate ourselves about the work being done on the other end of the spectrum. Dog trainers can learn how to communicate more accurately and effectively from advocates and advocates can learn how to better support the dogs, their families, and communities through a better understanding of canine learning and behavior from dog trainers. Learning from one another in this way, we can truly make a positive, lasting impact for the dogs we all love. Like Morgan said, this hits it the nail right one the head. Beautiful. Perfect. Thank you, thank you, thank you. Excellent post. Yes, we can all learn from each other. The trick and the challenge is to have people open minded enough to be receptive to the way others think, learn, and teach, to name a few. I’ve met some, ok., a lot of people, that are totally agains one way of training. Me? I think that I can learn from everybody. Why? No dog is the same as another and what works for one does not necesarily works for another. Another take on this topic. AFF is just the best, period. As always, you just perfectly nail it on the head! So well said. Thank you!